Since Bundle Monster Contest started, I've been playing around with my plates and trying to get something worth entering the contest. With spring in the air, I wanted to do something fresh. Not too bright, not too dark either. So I started with 2 coats of China Glaze Agent Lavender (sorry for the very dry cuticles, I'm trying to get rid of the problem). 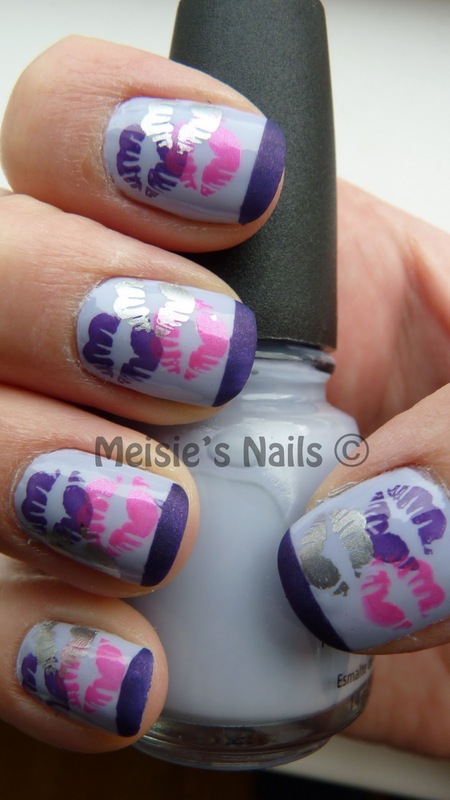 For the design I used Bundle Monster image plate BM02, stamped with China Glaze Grape Pop, Konad Special Stamping polish Psyche Pink and China Glaze Millenium. For the tips I used Zoya Savita.